It has been said that the most important reason a runner needs a coach is to help them with the time intervals between work, and not for the work itself. It is somewhat surprising that the concept of training at goal-paced effort or faster, punctuated by periods of rest in order to endure the effort, did not become a popular training modality until about 50 years ago. Now it is an accepted training routine for most middle-distance runners, but to this day the practical application remains anecdotal in the training literature. Middle-distance coaches routinely prescribe interval work, but are not at all sure how to alter the training effect of the workout based on the current needs of the athlete. For example, a workout of 6 times 200 meters can be either a speed endurance workout, an anaerobic efficiency workout, an anaerobic capacity workout, or an endurance workout; not by altering the repetitions or distance, but by altering the recovery interval. Further complications arise in sequencing workouts both within the training session and the microcycle sequence. For example, 6 times 60 meter strides done at the beginning of a training session is designed to improve maximum speed in the athlete. Move those same strides to after a six mile run and you have a workout designed to promote additional endurance, rather than maximum speed. The same problems are present in sequencing sessions within the microcycle, as some workouts need 48 hours to regenerate from, while others require 24 hours of regeneration. By not paying attention too these details the desired training effect of the workout changes drastically. Let’s get the terminology straight. Recovery is what happens to the physiology of the body after a bout of work ends. This can be monitored in many ways such as heart rate, body temperature, breathing rate, or by analyzing the blood for enzymes, hormones, pH, or lactate metabolites. Once the runner recovers to a certain desired level it is time to work again. In contrast, regeneration is what happens to the body in the time following the workout. The regeneration period is the time that the athlete’s fitness improves. The coach must prescribe enough resting time for the particular energy system and muscle enzymes used for a specific workout before another similar workout can be prescribed. Rest is defined as the absence of work. The word is used to describe the body’s physiology when a workload is not being applied. A good marker used in determining recovery time for an interval style of anaerobic work (8 x 400 meters as an example) would be the clearing rate of lactate. Lactate is a residue produced in muscle cells when glucose breaks down rapidly, but incompletely without oxygen. First, lactic acid is produced, which almost instantly reduces itself to a lactate salt and hydrogen ions. If there is lots of lactate present in the blood then we can infer that lots of hydrogen ions are also present which lower the pH of the blood and inter-cellular fluids causing acidosis. The culprit is hydrogen atoms in causing anaerobic (glycolytic) fatigue. This condition is similar to any weak acids effect on living things. Acid rain from sulfur pollutants damages plant tissue and acidosis in the body damages animal cells and tissue until it is neutralized. So lactate, which itself is actually harmless, becomes the marker to follow in setting up a recovery pattern in an interval workout in an attempt to tolerate the effect of acidosis. Since racing at any distance produces lactate, it becomes advantageous to “teach” the body to tolerate the effects of acidosis without destroying too many cells or degrading the effort too badly as the work wears on. Table 1 indicates the recovery time from a large dump of lactate (18 mmol.) 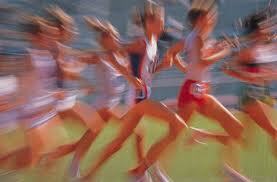 such as what would be produced in running a hard 400 meters. Active recovery would be characterized a combination of walking and jogging. It is now up to the coach to decide what percentage of recovery the middle-distance runner should achieve before the next bout of work begins. For example, a two minute recovery will achieve a 50% recovery rate for this marker. The workout is sure to degrade if many bouts of work are done with two minutes recovery time. If the intent is to keep the intensity of the work high then the recovery needs to be somewhere in the 80% range to ensure the workout will not degrade. In summary, any rest length can be prescribed, but always be aware of the percentage of recovery so that it matches the desired outcome of the training stimulus at the point in the macrocycle that your athlete is at.